If you are a woman, then you care about how to make your skin look clearer just by eating helping you lose weight. Roundup beauty foods to get started with. Some say beauty is in the hands of the beholder. However before you put it all on the line beauty is in your hands. The beauty secrets you use to shape your body affect all parts of your persona including how you skin looks as you turn heads towards a sharp gust of wind emitting your presence. What foods can I eat to have healthier skin giving me a more beautiful appearance? All is put on the table when people come together to discuss ways to enhance beauty with healthy skin tips on how to get clearer skin and foods that can help you get there incorporating Beauty Secrets from around the world in your diet. Along with Japanese beauty secrets, we bring together foods for healthy skin such as those even used by the starts to get the edge it takes to stand out, something to get you ready to step in the coliseum foot forward aiming in the direction to impress in the wake you make. In this daily roundup of Slism, we will present some beauty secrets women in Japan are using to get clearer skin including foods that you should consider if you haven't already adding to your diet for weight loss that as many others have experienced works. There is more to the morning curry diet than giving Ichiro what he needs to pull of amazing feats no less than ninja on the baseball field. 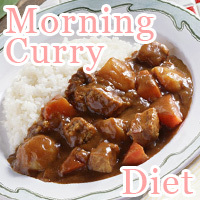 This curry diet gets its key from being recommended by Dr. Munetetsu Tei of Nihon Pharmaceutical University in Japan. Eating curry in the morning and having the freedom eat whatever you like for lunch and dinner always never going past 80 percent of your stomach capacity, really sums up the philosophy of Tei, The secret to lifelong health is to enjoy your slowly. Boost your metabolism surprising your body in the morning eating curry on the morning curry diet that once you get into makes it really hard not to love. Eating Japanese-Tororo seaweed for better looking skin as you lose weight. 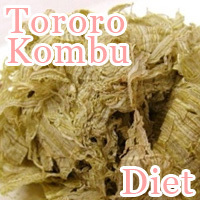 Like other Kombu, Tororo Kombu contains dietary fiber to help flush excess fat in your digestive tract out giving you a great tool to reduce unwanted fat absorption while on a diet. Note that Tororo seaweed contains Iodine, which means it would be a good idea to watch how much you eat. On the other hand it hardly requires any time to prepare and perfect for people who want to spend the minimal amount of time cooking. All you need to start on into the Tororo Kombu diet is add this edible seaweed to the broth of your soup or even layered between the bread sauce and vegetables in your favorite sandwich adding texture and nutritional value. The yogurt and wine diet where you have 200g of yogurt topped with 60mL of red wine once per day before a meal comes with many benefits you can take advantage of. Although you may not be willing to take the spill it would mean trying during breakfast, it works great for people looking to cut back in the evenings. 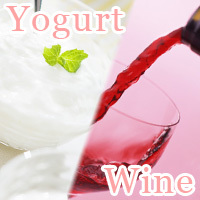 The yogurt-wine diet help prevent obesity taking away one of its causes giving your antioxidants while helping your return from a calcium deficit in your body. As you know there are many benefits from getting polyphenols in your body not limited to acting as a strong antioxidant. Unlike other forms of alcohol, beer and wine coolers, and such, red wine is not the enemy. The fact that red wine is up to 4 times as potent as green tea in polyphenols content may be one good reason consider switching up your diet and even consider looking deeper into the red wine diet. 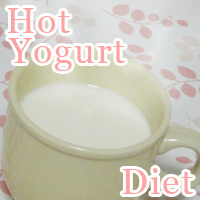 Replacing your breakfast with a steaming cup of hot yogurt is how one Hanako Yamada lost 15 pounds in a short month in a half time period succeeding in her diet. Although I am not saying this will work for everyone, the results you see differ from person to person. Still that doesn't mean you are brush out of luck. In addition to serving it up hot for breakfast treating yourself to a delicious cup of hot yogurt in the morning, staying without bounds (that's 80 percent of what you can really eat) during lunch and dinner and holding back on heavy drinking above all else is important in any diet. Hot yogurt!? - As gross as it sounds, it tastes better than what you are probably thinking. If you are not sure, just give it a try when you have a chance. Here are some healthy yogurt recipes including how to make hot yogurt to get started. Although eating meat is one of those topics that never get taken lightly especially when on a diet trying to lose weight eating healthy. Despite the buzz about too much meat in your diet, there still is hope for meat eating diets to lose weight. Naomi Watanabe (aka Japanese Beyonce) lost 20 pounds eating meat so what's stopping you. All you've got to do is lower the amount of carbs in your diet to a minimum while eating protein rich foods the way you normally do. For people looking for ways to flush out unwanted calories without having to throw away meat eating habits this diet may be right for you. 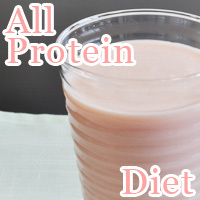 On the other hand if all you need is an alternative to getting protein in your diet without having to suffer from the sheer poundage eating fatty meats means to your body weight, then drinking protein powder may be exactly what you need to get over the hump in your diet. 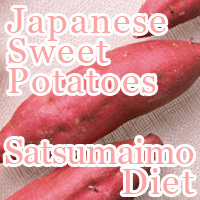 A diet on Japanese sweet potatoes Satsumaimo is a good source of dietary fiber and Jalapin that work great if you are looking for a way to improve bowel movement avoiding constipation related issues while on your diet. Satsumaimo is great for relieving constipation and improving your intestinal environment, not to mention helps boost your metabolism. Of course you can go on the same diet with similar foods like sweet potatoes but where eating Satsumaimo makes a difference is in calorie consumption. Let's face it, calories in your food matter. Luckily enough, Satsumaimo is low in calories and high in nutritional value allowing smoother weight loss. Time and time again when you switch your diet or are just looking for something else to try out to get the same results in weight loss, what starts out as dieting turns out to turn into rebuilding the wheel situation. Save yourself some time and check out more carbohydrate food to build your diet around. Just as spending more time delving into nutrition when cooking matters so does the time you spend warming up your body to down a healthy meal. In fact, just by spending 10 minutes before each meal getting warmed up eating a bowl of oil free salad dressed cabbage makes a big difference in calorie consumption. Japanese-manga artist Britney Hamada is said to have lost over 10 pounds in a month just on the cabbage diet alone! As attractive as it sounds not everyone is going to get by eating cabbage 3 more times a day. To get past the boredom you need a plan. 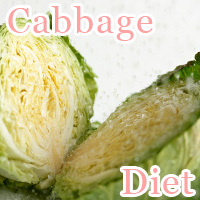 Note that the secret to getting through the cabbage diet in shape is to mix it up trying new and exciting dressings with your cabbage. There is a reason why avocadoes are considered the butter of the forest. Although most people may think that this is because avocado is a fatty food, there are other reasons left unconsidered. Avocado may contain fat but where it differs from lard and animal fat is unsaturated fatty acid content that means good fat in your body making it easy to lose later not to mention the vitamins and minerals you get from eating avocado. 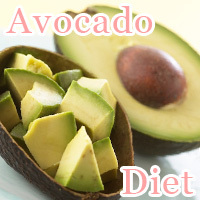 In terms of healthy fruits you should be eating when on your diet there is no substitute for avocadoes in terms of nutrition and other characteristics that makes it such an attractive health food such as appetite satisfaction. Famous Japanese opera singer Keiko Nakajima lost over 40 pounds in 3 months by going on the morning kiwi diet along with carrying out a regular exercise routine. 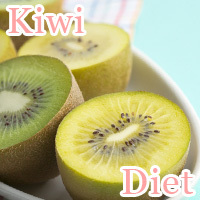 All you have to do is replace what you usually eat for breakfast with 1-2 kiwis while hydrating your body drinking enough water to make it through the morning. In eating lunch and dinner there are no strict dietary restrictions to speak of other than holding back 80. That means never going past 80 percent of what you can actually eat. Even for people who like to back light in the morning eating next to nothing. Eating kiwis in the morning makes a great times saver especially when you are on the run. It doesn't stop there. Here are some great smoothie recipes using kiwi fruit to add the jolt you need getting up and out the door in the morning. Former world champion Olympic figure skater Emi Watanabe is said to have gone on the zone diet. By balancing your carbohydrate, protein, and fat intake to a ratio of 4: 3:3, respectively, it is said to be the ultimate weight loss plan to get you in shape eating right. More hard as it sound to stay within bounds of the ratio system, in practice, it is easier than you think with all the books and help guides available nowadays. Getting back to the weight loss of Emi Watanabe, she is said to have lost as much as 20 pounds on the zone diet. 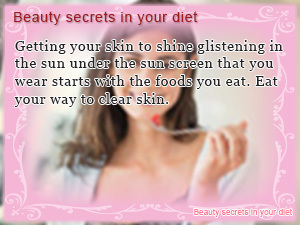 Getting your skin to shine glistening in the sun under the sun screen that you wear starts with the foods you eat. Eat your way to clear skin. 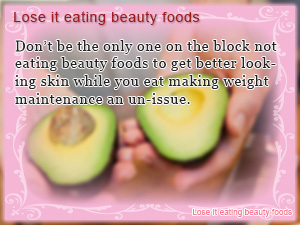 Don’t be the only one on the block not eating beauty foods to get better looking skin while you eat making weight maintenance an un-issue. When it comes to getting the beauty foods on one page that helps you navigate healthy eating for your skin roundups are the only way to go.